Tucked away in a little courtyard off HaRav Kook Street in Jerusalem, is the Museum of Psalms. This tiny building houses a collection of massive paintings by Rav Moshe Tzvi HaLevi Berger – the Museum was established under the patronage of the former Rabbi of The Kotel, R. Yehuda Meir Getz. 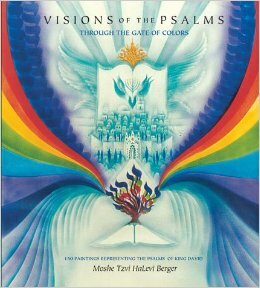 Inspired and encouraged by the late Lubavitcher ‘Rebbe’, Menachem Mendel Schneerson, Berger, now age 91, devoted nearly two decades of his life to creating a Kabalistic interpretation of each one of the 150 psalms. This entry was posted in Birds, Israel, Judaism-Birds Connections and tagged Jerusalem/Yerushalayim, Tehillim/Psalm. Bookmark the permalink.